Colombo Stock Brokers Association (CSBA) under the Presidency of Prashan Fernando in collaboration with Colombo Stock Exchange (CSE) and Capital Market Education and Training of Securities Exchange Commission (SEC) arranged a full day Continuous Professional Development Program (CPD) for all Investment Advisors, Research Analysts and Compliance Officers of the industry at the BMICH. CSE Chief Executive Officer Rajeeva Bandaranaike and SEC Director General Vajira Wijegunawardane outlined their assessment of capital markets and the way forward. Former stockbroker and now MAS Kreeda Managing Director and CEO Sarinda Unamboowe gave a motivational speech followed by a question and answer session. The full day program also included a presentation on the implications of the new SEC Act by Nithya Partners Partner Naomal Goonewardena and presentation by India-based officials from Bloomberg. 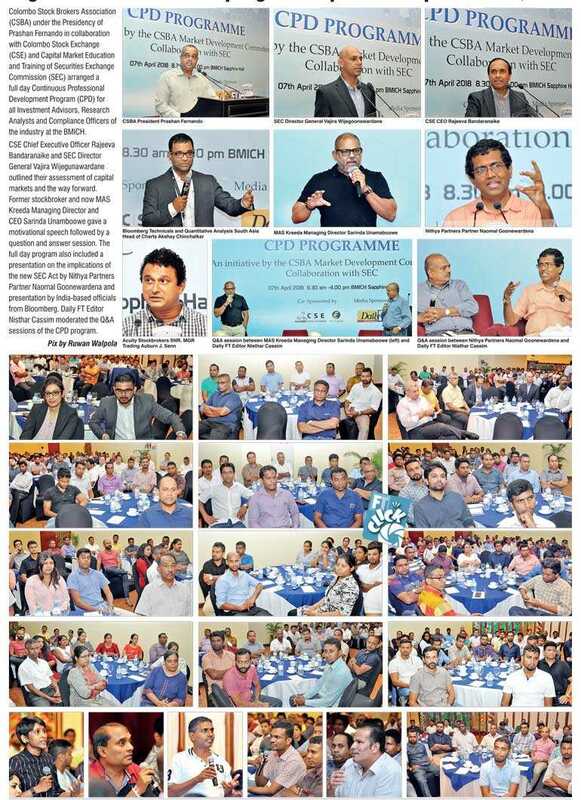 Daily FT Editor Nisthar Cassim moderated the Q&A sessions of the CPD program.